With the best ornamental iron doors on the market our company will work with you to create the most beautiful iron door you can possibly imagine. 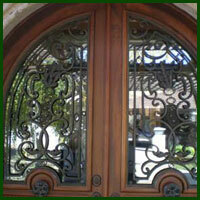 our San Diego, ca Iron Door division is simply class, taste and overall excellence. We offer a wide variety of ornamental iron doors in both standard and custom sizes and designs. Iron entry doors provide immaculate beauty and style without having to have a security screen door out front. When you compare our companies ornamental iron doors to other San Diego, ca Iron Door companies you will see why we are San Francisco's number one choice for Wrought Iron Doors. We have many different options in inventory for you to choose from. If you are looking for high-quality, interior wrought iron doors and exterior wrought Iron doors at an affordable price the you have found the best company in San Diego, ca! If you compare our wrought Iron door prices to other companies in San Diego, ca you will see how installing a wrought iron door with us will result in a huge savings.